We welcome Shabbat with a Kabbalat Shabbat service at 7:30 pm on most Friday nights. On the third Friday of the month, Shabbat Mishpacha is a service for families with children. Our clergy gives a sermon with a d’var Torah which on part of the parsha of the week. Services are followed by an oneg Shabbat where all can relax and socialize with some tea and dessert. Kids and families are invited and feel comfortable at all of our services. Shabbat morning services start at 10 am with Birchot Hashachar, morning blessings, and Pesukei D’zimra, verses of praise. A full Shacharit service follows. 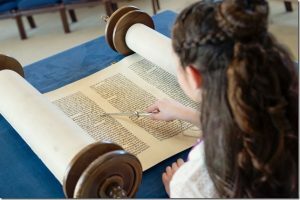 The Torah is read on the triennial cycle, followed by the Haftorah, Mussaf, and concluding prayers. Congregants who wish to read Torah or a Haftorah are encouraged to participate. Services are followed by a Kiddush and luncheon, often sponsored by a congregant, for all to nosh and enjoy together. Weekday minyans are held on Wednesday evening, the third Thursday evening of the month and one Sunday morning per month during the religious school year. A minyan may also be called for congregants during a Shiva period (at the synagogue or at the congregant’s home) or for a yahrzeit. Evening minyans are at 7:00 pm, and morning minyan is at 9:30 am. Tefillin are worn at the morning minyan. The Rabbi can teach participants how to put on tefillin for those who might be unfamiliar with this. Temple Shalom has Yom Tov services for all major Jewish holidays including Rosh Hashanah, Yom Kippur, Sukkot, Purim, Pesach, Shavuot, and Tisha B’Av. Each holiday has its special prayers and meaning which may be discussed by the clergy for all to learn. On Sukkot, some evening services and oneg may be held in the Sukkah. On Purim, all are invited to read a portion of the Megillah.